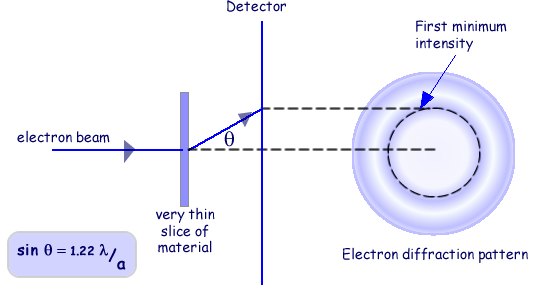 Electron diffraction is used to study matter by firing electrons at a sample and observing the resulting interference pattern. This phenomenon occurs due to the wave-particle duality, which states that a particle of matter (in this case the incident electron) has wave properties as well as particle properties. Because of this, an electron can be regarded as a wave just like light of sound waves. X-ray diffraction and neutron diffraction are also used to look at materials.Unlike other types of radiation used in diffraction studies of materials, electrons are charged particles and therefore interact with matter through the Coulomb Force. The incident electrons feel the influence of both the positively charged atomic nuclei and the surrounding electrons. In comparison, X-rays interact with the spatial distribution of the valence electrons, while neutrons are scattered by the atomic nuclei through the strong nuclear forces. In addition, the magnetic moment of neutrons (beyond the scope of A level) is non-zero, and they are therefore also scattered by magnetic fields. Because of these different forms of interaction, the three types of radiation are suitable for different types of study and give us a different aspect of the material - all of these building to increase our understanding. Electron diffraction is most frequently used in solid state physics and chemistry to study the crystal structure of solids. These experiments are usually performed in a transmission electron microscope (TEM), or a scanning electron microscope (SEM) as electron backscatter diffraction. In these instruments, the electrons are accelerated by an electrostatic potential in order to gain the desired energy and determine their wavelength before they interact with the sample to be studied. The periodic structure of a crystalline solid acts as a diffraction grating, scattering the electrons in a predictable manner. The observed diffraction pattern can be used to deduce the structure of the crystal producing that pattern. The higher the kinetic energy of the electron the higher its momentum (p= mv) so the smaller its wavelength. High energy electrons can therefore be use to look at the size of the nucleus of an atom as opposed to the arrangement of atoms in a crystal. The analysis of diffraction patterns is beyond the scope of this site but take it from me that they can be used to determine the size of objects that the beams are directed at. The intensity of the pattern produced is plotted against the angle the beam has been diffracted through ( ). An equation (that you do not have to worry about!) allows us to deduce the radius of the nucleus. 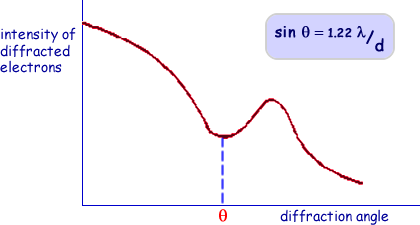 The angle at which the intensity dips most has to be found and the wavelength of the electrons used has to be calculated. Suffice it to say that you need to be aware of the technique and that it has limitations. Equations used assume a particular model of the nucleus - in this case that it is a solid sphere (which we know isn't exactly correct). Click on the icon - questions and answers at A level standard await you! Question 3 relates to this page.